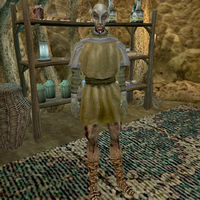 Ferele Athram is a Dunmer trader who has a shop in Tel Aruhn, where he has a variety of general goods for sale. He appears to be something of an amateur alchemist (though where he keeps his supplies is unknown, as he has no ingredients or apparatus for sale). He has, however, come up with a working formula for Cure Common Disease potions, information which he believes will be valuable to Bildren Areleth, the local apothecary (Bildren was working on a similar formula, but had evidently not discovered what would result from it, as is evident from the Sold Out Notice found in his store). This does not seem to be related to any quests, however, and Ferele does not provide any unique information. He wears a common shirt with matching pants, shoes, belt, ring, and amulet. He also carries a silver shortsword. Aside from his natural resistance to fire and the sanctuary provided by his ancestors, he knows the following spells: Almsivi Intervention, Divine Intervention, Mark, Recall, and Detect Key. This page was last modified on 23 November 2018, at 06:20.